The prototype two-seater Lilium Jet, a compact and lightweight electric plane capable of vertical take off and landing, completed an unmanned test earlier this month. 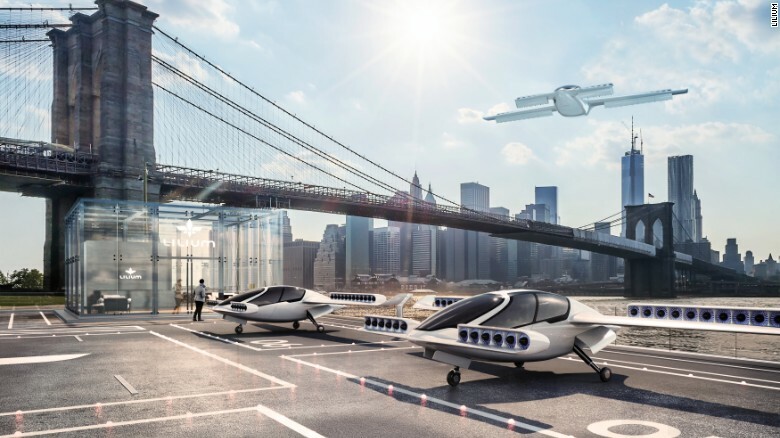 That's given its German creators the green light to forge ahead with plans for a five-seat production model designed for air taxi and ride-sharing services -- or what sounds like an uber Uber. "Seeing the Lilium Jet take to the sky and performing sophisticated maneuvers with apparent ease is testament to the skill and perseverance of our amazing team," co-founder and chief exec Daniel Wiegand says in a release. "We have solved some of the toughest engineering challenges in aviation to get to this point." The egg-shaped aircraft, which can be powered from a wall socket and could even take off from the garden, can ascend and descend vertically, like a helicopter. Its 36 jet engines then tilt on moveable flaps from vertical to horizontal to provide forward thrust, with wings providing lift as in a normal airplane. The Lilium Jet, which creates no harmful emissions and is quieter than conventional aircraft, is estimated to have a range of about 300 kilometers and a maximum cruising speed of 300 kilometers per hour. For maximum safety, each of the engines is individually shielded, so failure in one can't affect the others. Sophisticated sensors prevent the pilot from performing maneuvers beyond the jet's predetermined safe flight parameters. The sci-fi dream of climbing into a flying pod and commuting high above the gridlock has moved a step closer following the successful maiden flight of what could be the vehicle of the future, CNN reports.